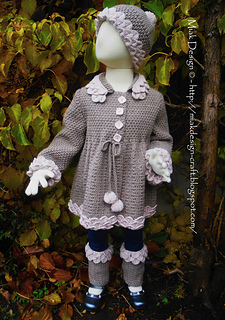 The Leg Warmers are made for the outfit with jacket and hat, but Marie is sure it will look very nice with any outfit. 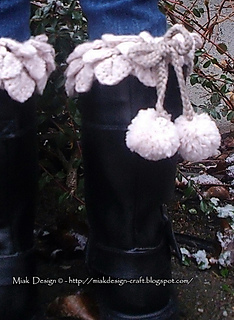 Really cute with the crocodile edge and pompoms. 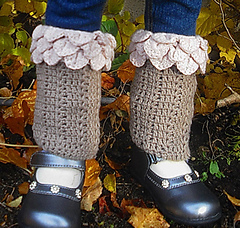 If you don’t want to mix colors, the leg warmers is gorgeous in one color too. Use them also in boots with the edge outside over the top of the boots. Nice and warm on cool days! 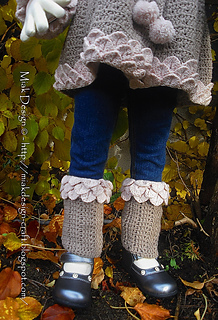 Maries leg warmers is made in 52 % Merino Wool - 48 % Cotton, but any yarn suitable can bee used. 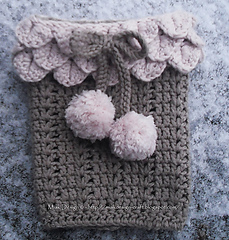 This pattern is written with American English crochet terms. Charts and measurements are in cm with inch in (-). Conversion charts for crochet hooks and terms in Am. Eng. and Br. Eng. Consisting of 8 pages with written instructions, images and tutorials, pattern diagrams and charts.